Omg, it was Margery’s grandmother Olenna (with Littlefinger) who poisoned Joffrey! She honestly would not have been the first suspect on my list, which I guess goes to show why she would realistically be able to get away with it. I gotta say though, that maternal instinct of hers is really admirable- I sure as heck wouldn’t want to leave my granddaughter in the ‘care’ of a sadistic monster like Joffrey. Whether she sees it or not, girlfriend really is better off with him dead. Speaking of Margery, I gotta applaud how fast she works to make sure that she’s able to sway Tommen over to her influence and not that of Cersei’s. My sister (who’s very familiar with the books) tells me though that Margery is really supposed to be no older than 15- this is kinda confusing to me, as Natalie Dormer (however lovely and talented) is umm…not 15. The wide age gaps between her and the actors portraying Joffrey and Tommen have proven kinda distracting to me into buying them as actual couples and I wish I knew why the producers of the show just didn’t decide to go with a younger actress to be more realistic. Ugh, I SO wish that poor Sansa could catch a break at sometime during this show. From Joffrey and Kings Landing to Littlefinger and the open sea/unknown? I honestly don’t know which one is worse. I can’t get over this yucky feeling that he schemed to lure her away from Kings Landing out of some sick fantasy he has about seducing her because he never was able to get Catelyn Stark for himself and feels like the daughter is the next best thing to her mother. The guy’s just a real creepy jerk. I loved the scene between Tyrion and Jamie in the prison cell. You could really feel the subtle respect that they have for each other, which Tyrion hasn’t been able to receive from Cersei or Tywin. Once again, to me it shows Jamie’s ‘nobler’ side and feeling of loyalty to Tyrion if for no other reason than for the fact that #1: Blood is blood, and #2: if it weren’t for Tyrion, he wouldn’t be getting better at learning how to fence with his left hand. Look, I like to oogle at the eyecandy that is Jon Snow more than anybody…but the truth is, that most of the time, I don’t care about what’s happening at the Wall. Same thing with Bran. If they could just meet up with some of the other characters elsewhere, I feel like I could get more into their storylines- but on their own? I just can’t get completely interested. 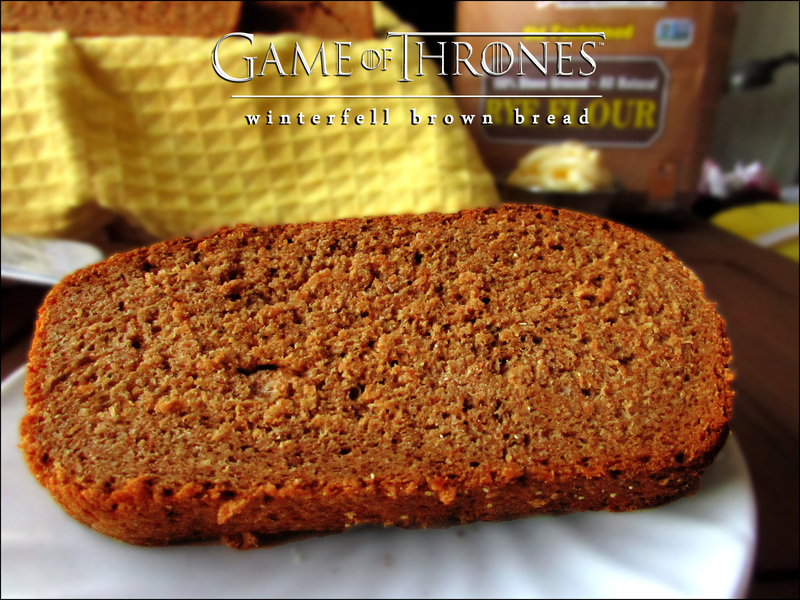 Today’s post is of a recipe that I knew I wanted to do for a GoT series before I even decided that I would actually be doing a GoT series. The inspiration for it just seemed so perfect. When I first started watching the show, one of the things that really pulled me into it the plot was Sean Bean’s performance as Ned Stark. I just loved Ned (and no, it wasn’t just because of his looks, although they certainly didn’t hurt). I loved him as husband, father, lord, and overall person. He was certainly good for what ailed Robert Baratheon (albeit too late), and I think would have made a far better king. One of the best things I loved about Ned was that he was all about protecting his family, and preserving all that he had managed to build at Winterfell. Think about it. Right. There you go. So, yeah, it’s really very good. 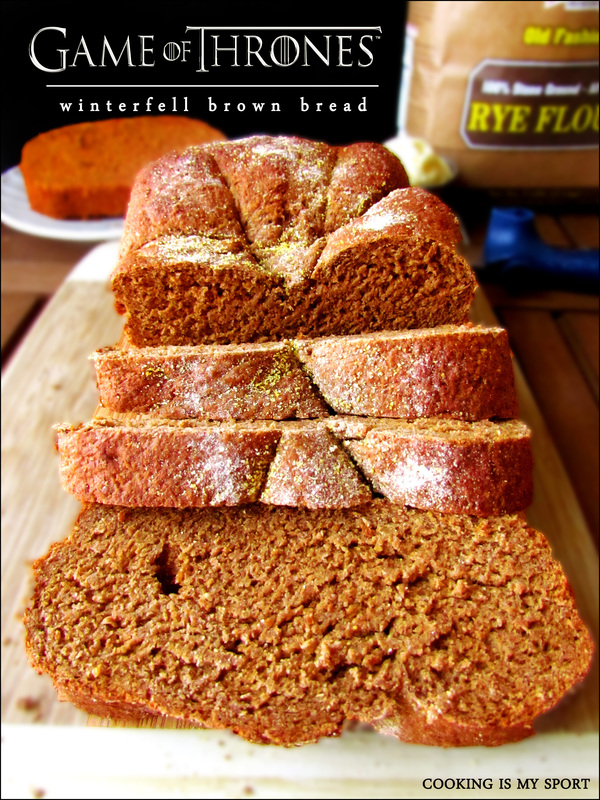 The rye flour gives it a really earthy, almost nutty flavor that I didn’t think I would actually like as much as I did. 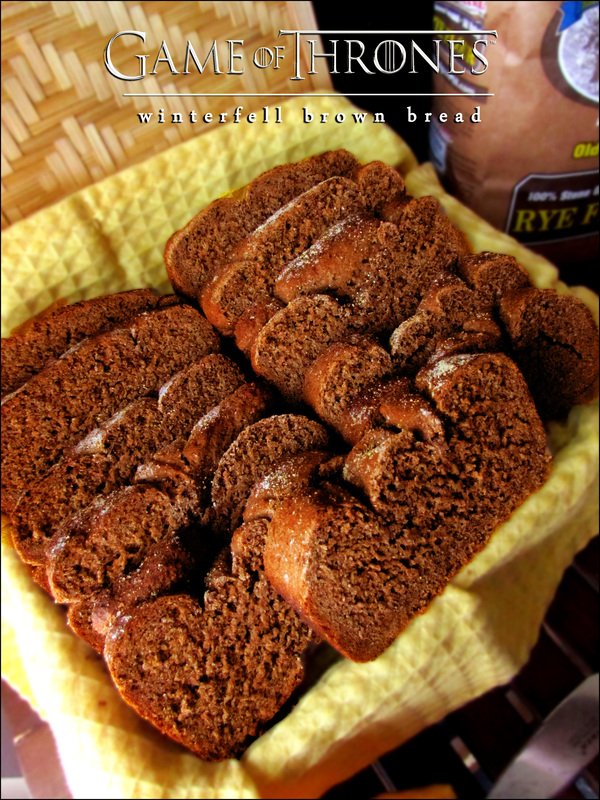 The molasses gives it a rich sweetness that isn’t too overpowering, along with the cocoa powder that also gives it that dark color that I was really looking for when I decided to make this bread. In short, it’s well worth the effort. One more thing: I would definitely recommend following the tip that I included below the recipe for a chewier crust- it’s the perfect crowning touch. 1. Put water in a large bowl. Add brown sugar and active dry yeast. Let yeast develop for about 5 minutes. 2. Add molasses, rye flour, vital wheat gluten, cocoa and caraway seeds. Beat well, then let sit for ten minutes. Mix in melted butter and salt. 3. Mix in 1 cup of Best For Bread Flour. Stir in enough of the remaining Best For Bread Flour to make soft dough and knead for 8-10 minutes. 4. Put dough in an oiled bowl, cover with damp cloth, and allow to rise in warm place for one hour or until doubled. 5. Divide the dough into two pieces. Gently knead to work out air bubbles and form into loaves and place in two greased loaf pans. 6. Cover with a damp cloth and allow to rise another hour or until the dough is nearly doubled. 7. Bake in a 400º preheated oven for 25 to 28 minutes. Immediately remove from pans and cool on a wire rack. * Chewy crust – Place empty metal baking pan on bottom rack in oven during preheating process. Directly after placing the bread in the oven, place ¼ cup of water along with a couple of ice cubes in empty metal pan and immediately close the oven door. Doing this along with slashing the top allows the bread to rise a little more during the first few minutes of baking and leaves it with a nice chewy crust. Looks great, Jess. So appropriate for GoT, too! 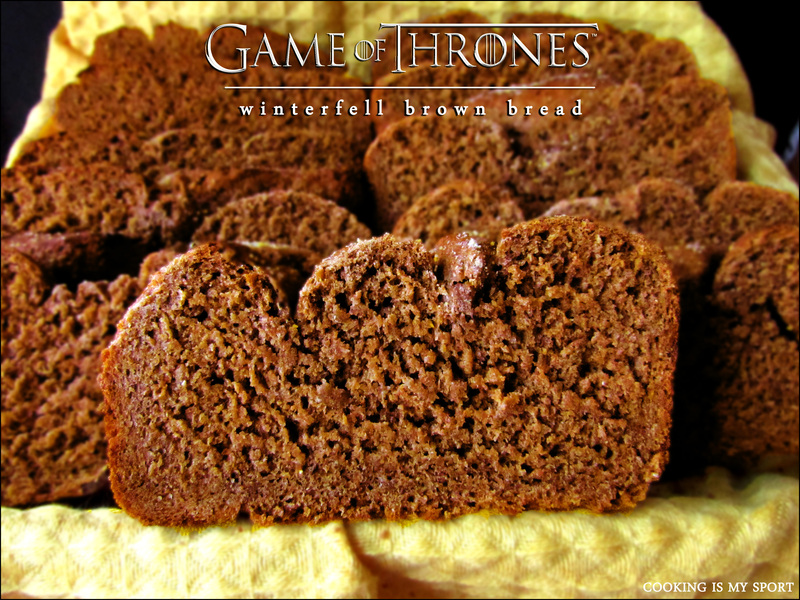 I will bake this up for next week’s episode for sure! 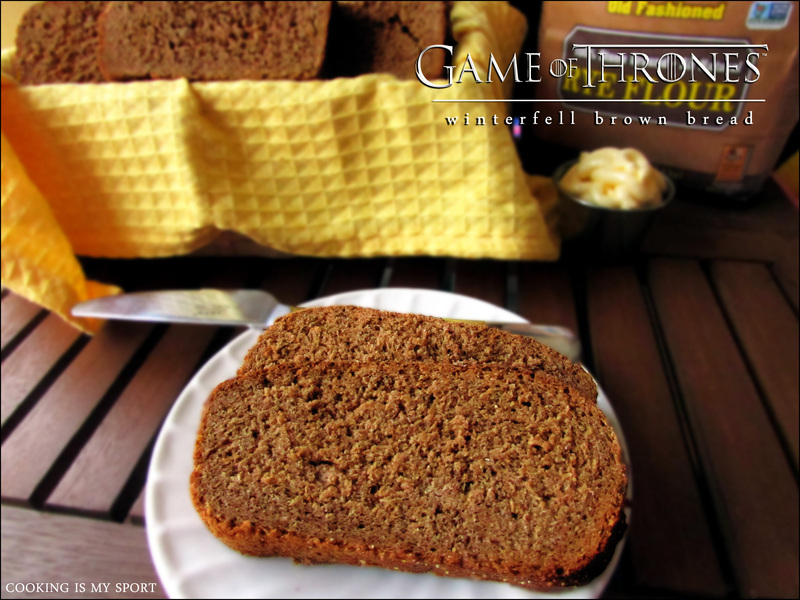 I love your Game of Throne series of recipes! They look so amazing and delicious! 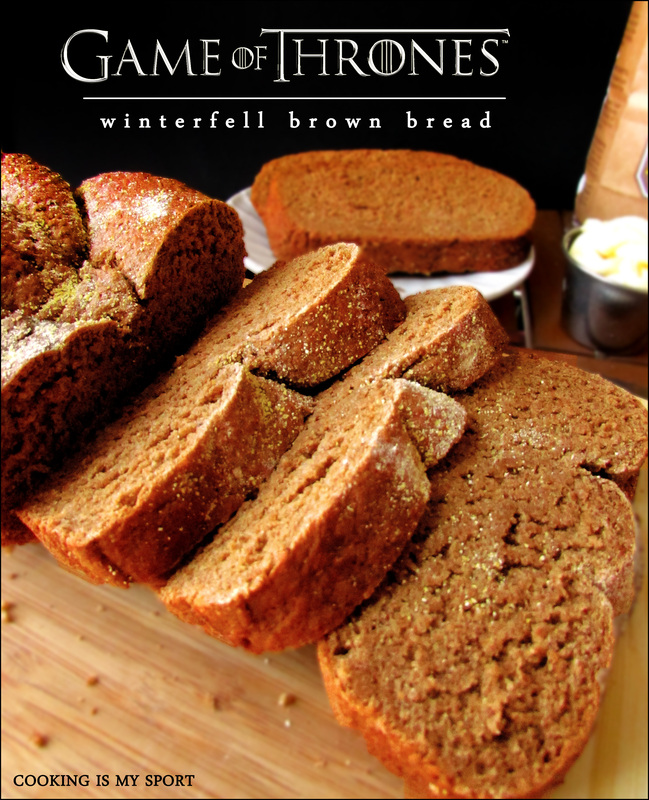 This bread looks really good! Thank you! You know, I’ll usually see photos and a recipe, and think “Oh wow…that looks so good.. I want to give it a try sometime”…. but these photos and this recipe… they’re different. I’m thinking “OH WOW!! This looks so delicious… I want it. I want it now!!! The photos are so beautiful, I can taste this lovely bread. I want it right out of the oven, with butter. 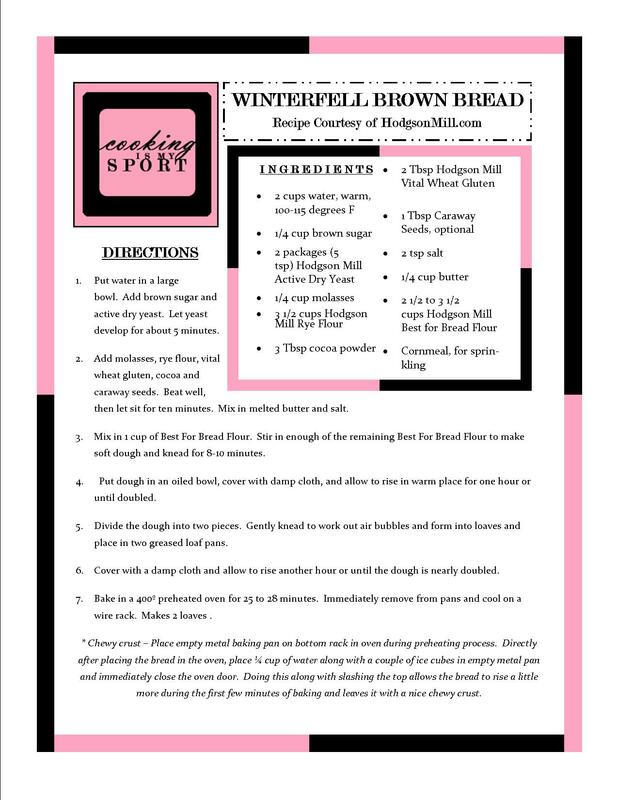 Wonderful post… fabulous recipe!! Brianne loves him that is obvious. But Jamie also loves her and Cersei is not happy, I just wait when she is going to send someone for her head. Glad she left. Yes it is 🙂 Tomorrow is the new episode, uhhhhh….